In my ongoing quest to document the under-examined world of populist economic sociology, I submit for your inspection this surrealist gem, snapped in Milan, 26 May 2007 on the wall of an alleyway. I hasten to include the date because if the image were more recent, I would have taken it for a witty visual metaphor for the sub-prime mortgage crisis: the one-eyed pyramid representing the US government, via Fannie Mae and Freddie Mac, reeling in borrowers with the promise of easy money, only to “get them on the hook” for debts they couldn’t service. Then again, that seems to be the modus operandi of the US government in relation to other countries, as well. The record of American presidents offering cash-for-compliance to foreign governments goes way back: for an account straight from the horse’s mouth, as it were, click here; for an anecdotal account of the practices (a bit thin on supporting evidence, in my view, but nonetheless an entertaining read) click here. The practice of withholding cash to punish non-compliance with the US agenda has an equally long history, Cuba being one of the most glaring examples. These data could be interpreted in a number of ways in relation to the graffito. 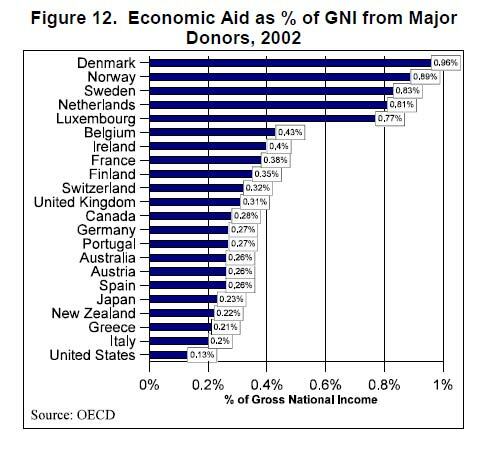 Perhaps Italians see a significant qualitative difference in the way their country uses foreign economic aid, in contrast to the US strategy. Or maybe the sheer volume of money the US has to distribute overseas (in absolute terms, rather than as a percentage of GDP) leads to the perception that we can lure other nations as easily as a skillful fly fisherman working a stocked pond. 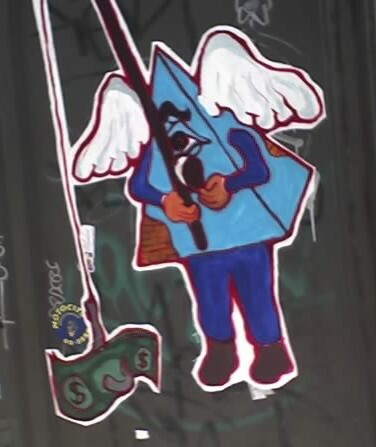 But then, what are we to make of the angelic wings on the one-eyed pyramid? Do they suggest benignity or ubiquity? I also wonder why the best graffiti I’ve seen anywhere in the world–both in terms of aesthetic value and socio-economic commentary–come from Italy. I’ve seen graffiti everywhere in my travels around Europe, Asia and the Americas, but the Italians produce by far the most intellectually sophisticated and visually appealing images (see my “Socialist Snail” post below for another example). I wonder if it has something to do with Italy’s strong Communist Party affiliations, and the excellence that current and former Communist countries have exhibited in producing propaganda…a more formal medium than graffiti, to be sure, but one with similar persuasive objectives. I’ll try to find some photos from my personal collection of Chinese, Russian and Cuba propaganda posters to illustrate my theory…watch this space!